"The art of teaching is the art of assisting discovery"
Hi! I'm Debbie Coyle and I love fiber arts! I have been involved with fiber arts since 1972 and have been teaching fiber arts, crafting, and other subjects since 1985. I have taught weaving (inkle and pocket), knitting, cross-stitch, spinning, kumihimo, lucet, potpourri, bath salts, flavored vinegars, and more. I also enjoy crochet, needlepoint, Tunisian crochet, beading and other crafty skills. I teach at most Griffin Dyeworks events; and several Southern California Living History (SCA) events (where I'm known as Lynnette de Sandoval del Valle de los Unicornios) either as formal classes, one on one instruction, or as part of the Fiber Playdays I host at many SCA events. I have also been a guest instructor for Experimental Archaeology classes at the University of Southern California, taught several Pasadena City College Extension classes, and been involved with several Elementary and Middle school demos. At the LA County Fair, I have received blue ribbons for knitting and weaving, and red ribbons for spinning and crafting. Within the SCA, I have been awarded 3 local arts awards for practicing and teaching: one each for kumihimo, lucet, and inkle; 2 regional awards for practicing and teaching: one for herbal, and one for brewing; and an advanced regional award for practicing and teaching weaving. Below are the classes I'm currently available to teach. They are classes that I've designed and have taught to various sized groups. If you're interested in having me teach a class, please contact me for more information. 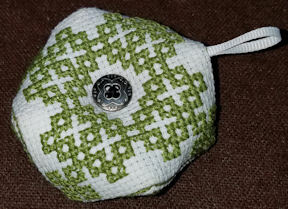 Description A biscornu is an interesting eight-sided stuffed pincushion or ornament. They are very quirky and fun! Biscornus can be used for pin cushions, ornaments, and jewelry. They also make great gifts! No experience at anything is needed, but knowledge of hand sewing is a plus. Skill Level: Beginner. Hand sewing involved, and will be taught in class. Description A biscornu is an interesting eight-sided stuffed pincushion or ornament. They are very quirky and fun! Biscornus can be used for pin cushions, ornaments, and jewelry. They also make great gifts! No experience at anything is needed, but knowledge of counted cross and/or hand sewing is a plus. In the 1st class we'll cover how to cross stitch and start on the stitching the biscornu covers. You'll finish the cross stitching at home between the classes. In the 2nd class we'll sew, stuff and finish the Biscornu. And you'll take home your own Biscornu! Skill Level: Beginner. Cross stitch (14 stitches to the inch) and hand sewing involved, and will be taught in class. 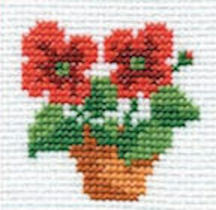 Description Cross stitch is a fun and easy way of decorating fabric. Too impatient for embroidery? Then cross stitch might be for you! This is a hands-on class. You’ll get your hands busy stitching a small project! Skill Level: Beginner. Cross stitch (14 stitches to the inch) involved, and will be taught in class. Description Tired of losing your sewing needles? Looking for elegant and convenient way to store them? Looking for a great gift idea? We’ve got your covered! This is a hands-on class, you’ll be making your own needlebook. No experience at anything is needed. Experience at hand sewing is helpful, but knowledge of counted cross and/or hand sewing is a plus. In the 1st class we'll cover how to cross stitch and start on the stitching the needlebook cover. You'll finish the cross stitching at home between the classes. In the 2nd class we'll sew, and finish the Needlebook. And you'll take home your own Needlebook! Description Just beginning to Inkle? This class begins at the beginning. We’ll cover all the basics of designing a pattern, warping up the loom, and weaving. Students are encouraged to bring their own equipment and yarn so they know how to use their own loom; but loaner looms will be available and the instructor will have yarn available for sale. Skill Level: Beginner. Everything will be covered in class. Materials I will provide handouts, heddle yarn, loaner looms (to be used in class only), and yarn for sale. Description A lecture and discussion class covering weaving techniques that go beyond warp based designs. 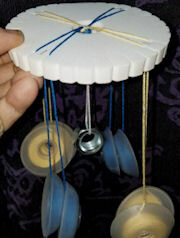 We'll talk about: bead work; adding loops, bells, and fringe; brocading; pickup work; using multiple shuttles; and more. There will be no hands on activity in the class but there will be descriptive handouts and demos. Skill Level: Intermediate. Inkle weaving experience in not necessary as we won't be weaving, but it is helpful. I'll be discussing ways to augment and modify inkle weaving and a familiarity with weaving terms and concepts will be helpful. Description If you've been getting all your inkle warp patterns from books, the internet, or friends ... come on down and learn to create your own patterns. Warp in lines, chains, bars, piano, keys, and more. This will be a lecture class, so your level of inkle weaving abilities do not matter. Beginner or expert weavers are all welcome. Description Tired of only using warped in inkle patterns? Learn how to add patterns as you weave using pickup work and brocading. We'll cover how to add brocading to your weaving, and how to warp up for and do 2 types of pickup works. This will be a lecture and demo class. 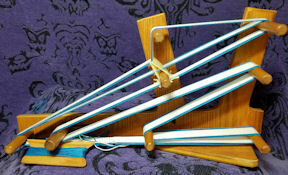 But instructor will have inkle looms warped up for students to play with the different techniques. 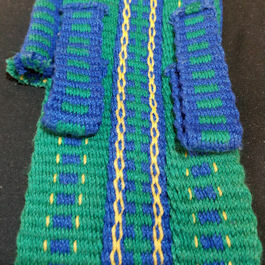 Description Knit a beaded bookmark to learn the basics of knitting with beads. This is not a beginning knitting class, we will be knitting with Size 0 needles, using only the knit stitch. We will also be using the long tail cast on, it’s a plus if students know that ahead of time, but it will be taught in class. Skill Level: Intermediate. This is not a beginning knitting class, students need to know the knit stitch and be comfortable using Size 0 needles. We will also be using the long tail cast on, it’s a plus if students know that ahead of time, but it will be taught in class. Description Make a fun piece of holiday jewelry! This is not a beginning knitting class, we will be knitting with Size 0 needles, using only the knit stitch. We will also be using the long tail cast on, it’s a plus if students know that ahead of time, but it will be taught in class. Description Learn how to do Kumihimo (Japanese braiding) on a handheld disk! It’s a fun and portable way to create cords! The Kumihimo cord is useful for drawstrings, necklaces, trim, ribbon, bracelets, shoe laces, and more. For beginning kumihimo braiders. Options 1 of 3 different braid styles: Round cord, Flat cord, or Square cord. With advance notice I can customize for holidays, seasons, or event theme colors. Description Learn how to do Kumihimo (Japanese braiding) on a Marudai braiding stand! It’s the same technique as on the handheld cards, but more elegant and faster! The Kumihimo cord is useful for drawstrings, trim, ribbon, bracelets, shoe laces, and more. For beginning kumihimo braiders, or for experienced kumihimo braiders who are beginning marudai users. Description Want to know learn kumihimo (a Japanese braiding technique)? 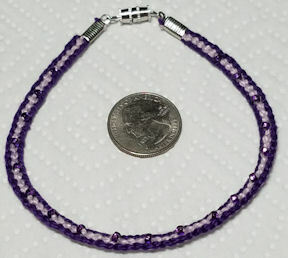 Want to learn how to add beads to your kumihimo? This is the class for you! No experience at anything is necessary. You'll learn how to make a flat braid, how to add beads to it as you braid, and how to attach a clasp to finish your jewlery. It’s fun and portable! Options Class can cover adding beads down the center or along the edges. I can customize colors for holidays, seasons, or event color themes. Description Lucets are totally portable and fun to use! Lucet made cord is an to kumihimo, icord and crochet chains. The cord can be make from any yarn and can be used for drawstrings, trim, frogs, shoelaces, and any other cord uses. No experience at anything is required. Description Lucets are totally portable and fun to use! Lucet made cord is an to kumihimo, icord and crochet chains. 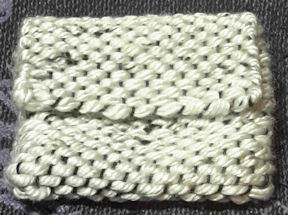 The cord can be make from any yarn and can be used for drawstrings, trim, frogs, shoelaces, and any other cord uses. Class will cover a method of lucet cordmaking that uses 2 threads, allowing for two color cords, button holes, and other fun stuff. No experience at anything is required. Class will cover adding "gimp" cords to a 2 thread method of lucet cordmaking. The gimp cords are not only decorative, but they also allow for the addition of beads and other augmentations to your finished cord. Skill Level: Intermediate. Studetns will be expected to know the the techniques taught in "Beginning Lucet with 2 cords". Description Tired of losing your sewing needles? Looking for elegant and convenient way to store them? Looking for a great gift idea? We’ve got your covered! This is a hands-on class, you’ll be making your own needlebook. No experience at anything is needed. Experience at hand sewing is helpful, but not necessary. 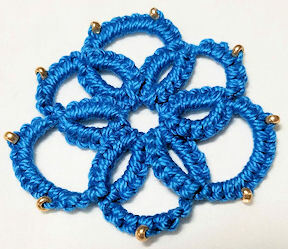 Beginning Needle Tatting -- Make a beaded flower! Description Come learn needle tatting -- like shuttle tatting, but without the shuttles! If you’ve tried and failed at shuttle tatting (as I did), you’ll love needle tatting (as I do)! 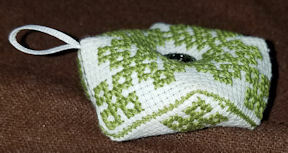 The class will use size 3 crochet cotton on a long tatting needle. We’ll practice the stitches and then start making a flower motif! Description Learn how to braid ribbon bands. They are great for bookmarks, trim, headbands, bracelets, and more! 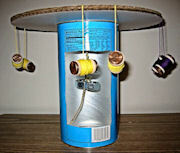 Come on in and learn (or remember) this fun and simple craft. Class Covers Starting, braiding, and finishing a ribbon braided wreath pin. 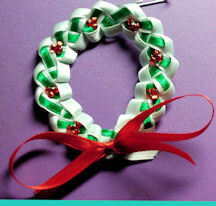 Description Learn how to make a ribbon braided wreath pin for the holidays! Come on in and learn (or remember) this fun and simple craft. No experience at anything is necessary! Description Learn how to weave using a 5’x7’ board loom to make a small pouch. 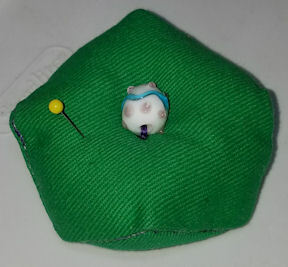 The pocket looms are fun, quick, easy, and handy. They can be used to weave in the round and make a drawstring pouch, a pouch with a flap, or a flat woven piece to be used for a coaster, wall hanging etc. No experience with anything is required. If you’re an experienced weaver and haven’t used a pocket loom before, come on down and a learn a new method -- You can never know enough ways to weave!! !